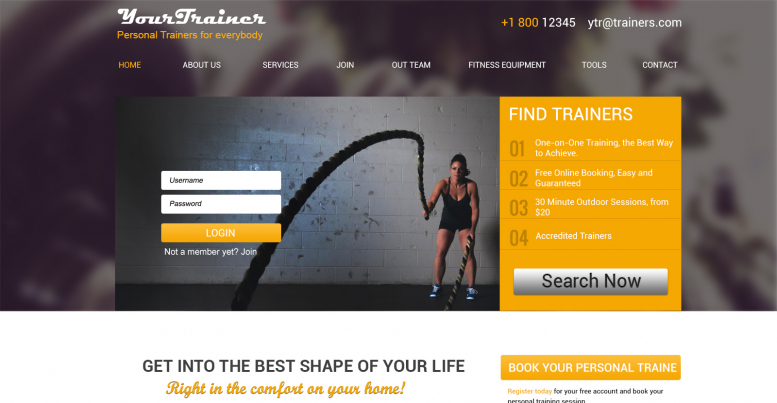 If you want to set up a great website for hiring trainers, then our template is an amazing choice for you! We offer you an enthralling, highly responsive design bound to always satisfy the users. Your website will be available all over the world and on all known devices. It has an absolutely simple documentation, a very easy and intuitive installation process, and an ultra clean code. This template is pre-loaded with a cool sports design, so, it definitely will make your visitors never leave your website. 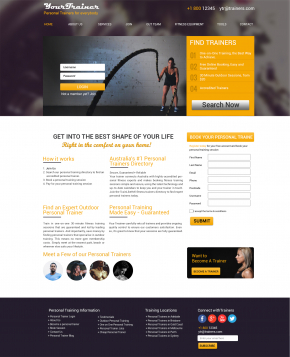 The homepage of Your Trainer displays an eye catching banner, with a small login form and the attractive features of the website. It also features the sign up form on the home page using which people looking for trainers can easily register. The text section of the page is divided into four smaller sections to display different information like How it works. A section is provided to show the top trainer available on the website and registration procedure for the trainers. The footer of the template has the links to all important pages, social media links and newsletter subscription form. $22.00 The simple license would allow you to use the template to create one website.